Participants and judges of the 2017 Global Health Case Competition. 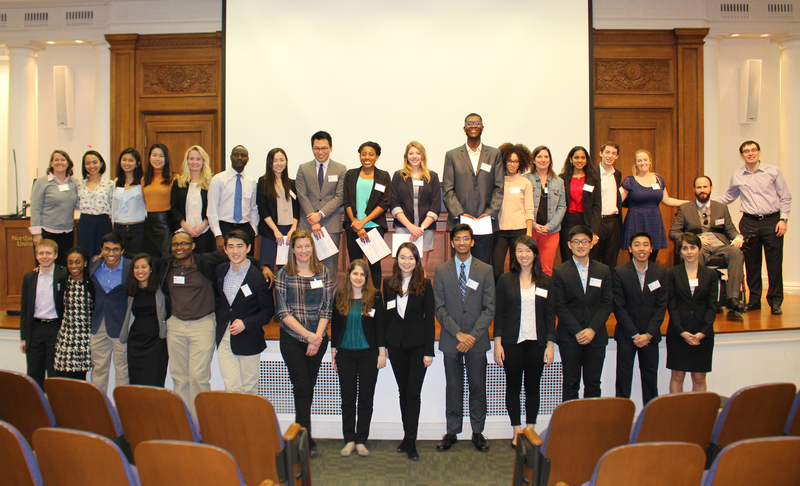 On February 18, 2017, Northwestern held its 4th Annual Global Health Case Competition (NUGHCC). Graduate and undergraduate students from various disciplines come together and respond to 21st century global health challenges by developing innovative solutions. Every year, a different “case,” is presented: these could range from infant HIV testing in Tanzania to drug crimes in Honduras. The purpose of this competition is to cultivate awareness about the issue as well as encourage creative thinking and interdisciplinary cooperation. The 2017 Competition brought together 30 students from 8 schools divided up into six teams. The teams then presented their solutions to a panel of judges: Kara Palamountain, MBA (Research Associate Professor at the Kellogg School of Management), Sera Young, PhD (Assistant Professor in Northwestern’s Department of Anthropology) and Maxwell Akanbi, MBBS, MSCI (Center for Global Health International Fellow at the Feinberg School of Medicine). The 2017 case focused on reducing neonatal mortality in Nigeria by adopting widespread use of an antiseptic gel called chlorhexidine. The case was authored by Kara Palamountain, one of the judges in the panel. Infection and sepsis are among the top leading causes of neonatal death in Nigeria, and the umbilical cord is a major entryway to infection. Because chlorhexidine is cheap, locally manufactured and proven to be effective, the goal was to integrate this drug into Nigeria’s healthcare institutions, culture, and maternal care regime. The six teams each developed a range of solutions, from implementing mass distribution operations to launching marketing campaigns. 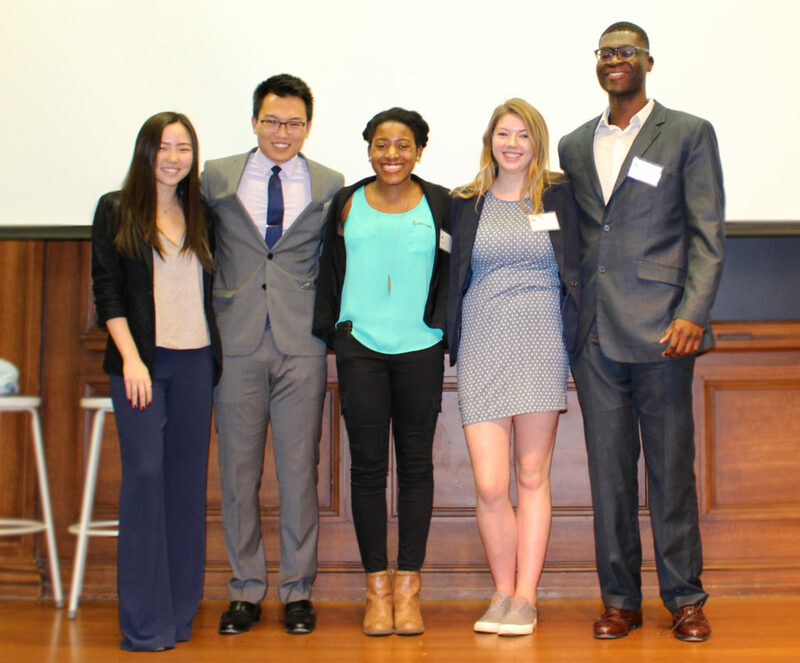 The winning team was made up of five members: Maria Clark (WCAS), Sedoo Ijir (WCAS), Emmanuel Darko (WCAS), Max Wang (FSM) and Courtney Zhu (Medill). This year, I participated in the Case Competition and had the experience of being part of an incredibly diverse, dynamic team. My teammates all came from varying backgrounds with different areas of expertise, and my most valuable takeaway was getting to learn from them. Together, we educated ourselves on the issue of neonatal mortality in Nigeria as well as the sociocultural forces that perpetuate this high rate of neonatal death. After many group meetings and a mentor session with Peter Locke–an Assistant Professor of Instruction in Global Health Studies, we were named the winning team of the 2017 Competition. Our team’s approach centered around the creation of a birth kit, a unified package of essential items necessary for home birth including chlorhexidine. Sustainability was one of our core values: creating a demand for the birth kit and normalizing chlorhexidine in Nigeria’s maternal care culture. The three-year implementation timeline included tactics such as capturing interest of Nigeria’s key stakeholders, establishing a partnership with a non-profit, non-governmental organization, utilizing effective marketing strategies and finally, launching the production and distribution of birth kits. From this experience, I gained insight into the mechanism of tackling modern health challenges and realized just how valuable collaboration is in a multidimensional field like global health. The Case Competition–in its entrepreneurial and energetic form–gave me knowledge a traditional classroom could never provide. I learned that every global health operation is like a machine: there are many gears and components working simultaneously in motion. NUGHCC pushes every participant to put their existing knowledge to practice. It encourages everyone to think imaginatively about global health challenges and how to approach them. There is no single “right” answer. Rather, it is through collaborating that real innovation is born. The Case Competition is co-sponsored by the Program of African Studies, Program of Global Health Studies, Feinberg’s Center for Global Health, Pritzker School of Law’s Center for International Human Rights and the US Department of Education.